Maritime disputes between Belize and Guatemala continue, as the Belize Coast Guard (BCG) and Guatemala Navy had an altercation on Thursday, May 28th. Reports surfaced that Guatemala officials demanded BCG to move from an area they were working on in the Sarstoon Area. The issue is that BCG were in Belizean territory and it was the Guatemalans who were trespassing, and as such they stood their ground and didn’t not move. Shortly after the incident, the Government of Belize (GOB) sent out a diplomatic note of protest to the Government of Guatemala. No official statement has been released from either government, but Guatemalans are accusing BCG to have been in their waters. Initial reports indicated that BCG were working near Sarstoon Island where a base is to be constructed, when they were approached by the Guatemalan Navy. Claims are that the Guatemalans demanded the Belizeans to evacuate the area as they were in Guatemalan waters. But the area were the confrontation occurred was in Belizean waters, and as such, BCG responded to the Guatemalan Navy stating they were the ones intruding. The Guatemalans left but later returned with a larger force, making the same demands again. BCG did not back down, and after a verbal exchange, the Guatemalan Navy left. “We had a Coast Guard patrol that went into the Sarstoon area yesterday and at about midmorning, between ten and eleven, while they were in the area of the Sarstoon Island, they were approached by Guatemalan naval patrol which went there to inquire what the Coast Guard activities in the area was. The commander of the patrol at the time informed them that they were in Belize and that they should leave. The Guatemalan patrol then left, and later on that evening, they came back with two vessels and a captain who was in charge of the detachment from the Guatemalan navy. The commander of the BCG’s patrol had a very good dialogue and communication with the captain. They were informed that they were the ones who have now committed an incursion and so ‘we are asking you to leave’. They initially refused. After further diplomatic discussions, BCG patrol moved back to the mainland and the Guatemalan Navy was told to move back to their base on the other side,” explained Chief executive Officer of the Ministry of National Security, Retired Colonel George Lovell. The news of the incident was not taken well by the Belizean public, who claimed that this was a result of GOB accommodating Guatemala’s request in regard to the territorial dispute. Belize Minister of Foreign Affairs, Wilfred Elrington, who was at the time in Guatemala City, indicated that Guatemalan government officials were not aware of what had occurred but that they were already addressing the matter. “We were contacted by the Guatemalan officials, who told us that they were not aware of what was going on, but that they were in fact circling the island. The Guatemalans told us that they did not know what the intention of the Belizeans there was. I then got in touch with the Guatemalan Foreign Minister. After discussion with the Prime Minister of Belize (Honorable Dean Barrow) and the Government of Guatemala, the problem was resolved by the following day,” said Elrington. 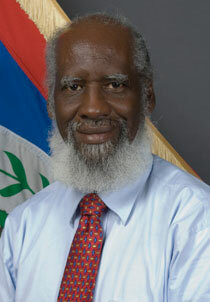 Elrington stated that the solution to the problem came from Barrow who instructed BCG to leave the area the next day. To many, that does not seem like a solution, but rather as Belize, accommodating Guatemala once again. “My understanding is that the Belizean contingent moved off the island and that defused the situation. Guatemalan officials were very professional and very mature. They did not know what was happening. It was something that caught them by surprise. They wanted to be informed as to what the situation was. And once that was done and it was clear to them that there was no hostile act on the part of Belize, the matter was resolved quite easily by the Prime Minister and the people here. The information was conveyed to our Prime Minister and the final decision was made by him as to what needed to be done. We were also informed that the strength of the Guatemalan contingent in that area was much more than ours. And they have two powerful gunboats. All of that information we were able to transmit to our Prime Minister, and he was the man who in fact dealt with the rest of it,” said Elrington. This was not the first incident of this nature, the most recent incident was in February 28, 2015 when 37 Belizeans were apprehended by Guatemalan authorities, who claimed they were in their [Guatemalan] territory. 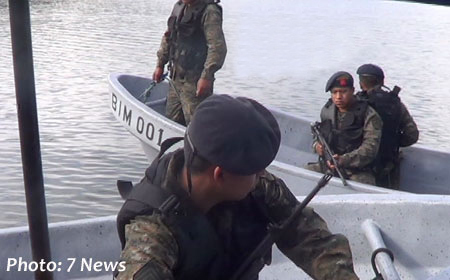 In addition, many residents in Southern Belize claim that the aggression is a standard behavior for the Guatemalan Navy who patrol the Sarstoon River.